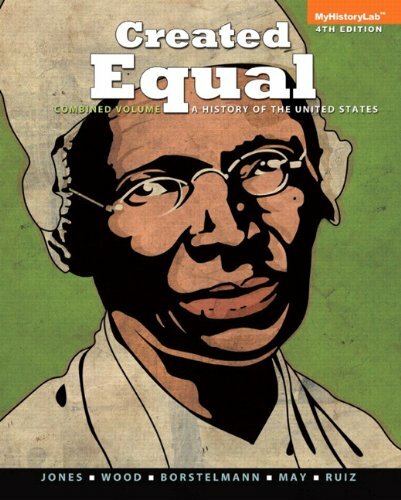 9780205728909 | 3 brief edition (Prentice Hall, July 21, 2010), cover price $135.60 | About this edition: Explores American History through the theme of equality. 9780205962532 | 4th edition (Prentice Hall, December 22, 2013), cover price $68.00 | About this edition: Re-examines American History through the theme of contested equality Taking an inclusive view of American history, Created Equal emphasizes the struggles for equality experienced by diverse groups of Americans across the many regions of the nation. 9780205962518 | 4 combined edition (Prentice Hall, December 12, 2013), cover price $87.20 | About this edition: Re-examines American History through the theme of contested equality Taking an inclusive view of American history, Created Equal emphasizes the struggles for equality experienced by diverse groups of Americans across the many regions of the nation. 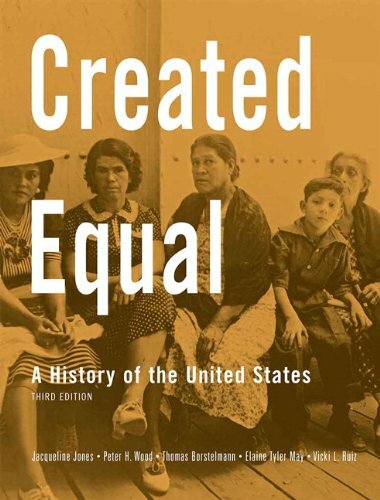 9780205585816 | 3 edition (Prentice Hall, January 15, 2008), cover price $195.33 | About this edition: With its sweeping, inclusive view of American history, Created Equal emphasizes social historyincluding the lives and labors of women, immigrants, working people, and minorities in all regions of the countrywhile delivering the familiar chronology of political and economic history. 9780205950348 | 4 pck pap/ edition (Prentice Hall, July 30, 2013), cover price $167.07 | About this edition: ALERT: Before you purchase, check with your instructor or review your course syllabus to ensure that you select the correct ISBN. 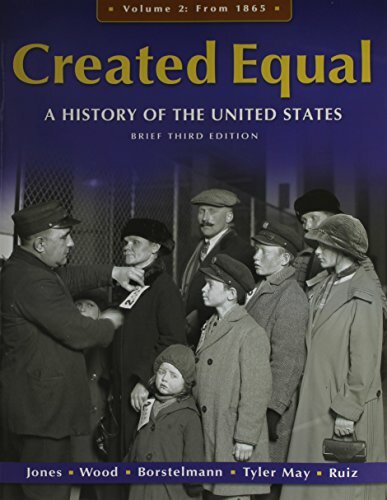 9780205901302 | 4 combined edition (Prentice Hall, July 21, 2013), cover price $158.40 | About this edition: Re-examines American History through the theme of contested equality Taking an inclusive view of American history, Created Equal emphasizes the struggles for equality experienced by diverse groups of Americans across the many regions of the nation. 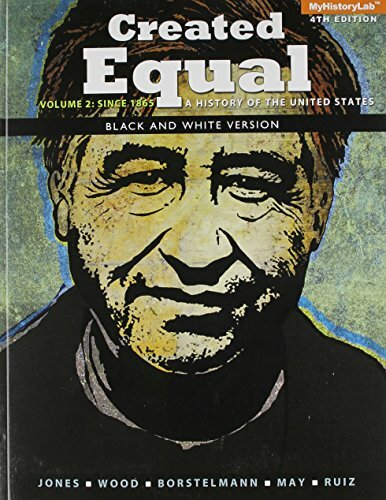 9780205905263 | 4 pck lslf edition (Prentice Hall, July 24, 2013), cover price $94.67 | About this edition: Re-examines American History through the theme of contested equality Taking an inclusive view of American history, Created Equal emphasizes the struggles for equality experienced by diverse groups of Americans across the many regions of the nation. 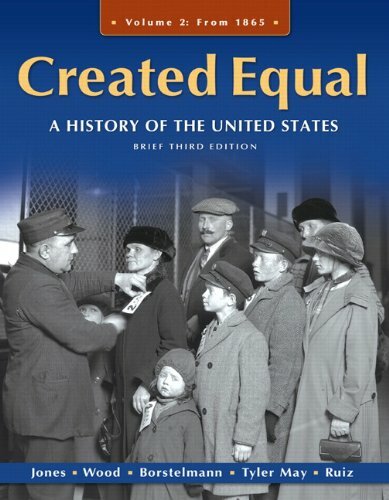 9780205900060 | 4 lslf edition (Prentice Hall, July 21, 2013), cover price $86.00 | About this edition: Re-examines American History through the theme of contested equality Taking an inclusive view of American history, Created Equal emphasizes the struggles for equality experienced by diverse groups of Americans across the many regions of the nation. 9780134378855 | 5 pck pap/ edition (Prentice Hall, February 12, 2016), cover price $131.07 | About this edition: NOTE: Before purchasing, check with your instructor to ensure you select the correct ISBN. 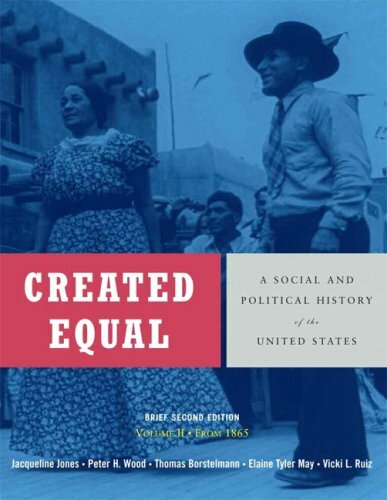 9780133834666 | 4 pck pap/ edition (Prentice Hall, December 20, 2013), cover price $65.33 | About this edition: Re-examines American History through the theme of contested equality Taking an inclusive view of American history, Created Equal emphasizes the struggles for equality experienced by diverse groups of Americans across the many regions of the nation. 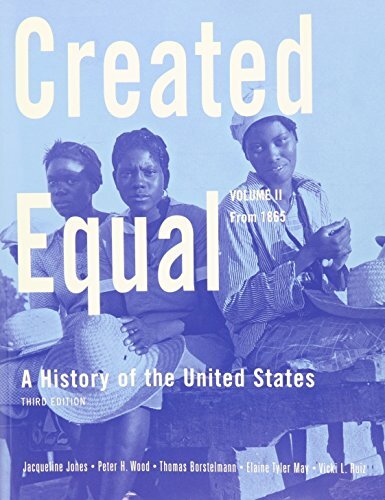 9780205899548 | 4th edition (Prentice Hall, July 19, 2013), cover price $125.80 | About this edition: Re-examines American History through the theme of contested equality Taking an inclusive view of American history, Created Equal emphasizes the struggles for equality experienced by diverse groups of Americans across the many regions of the nation. Product Description: Jones, Jacqueline A., Wood, Peter H., Borstelmann, Thomas, May, Elaine Tyler, Ruiz, Vicki L.
9780205900046 | 4 psc stu edition (Prentice Hall, July 5, 2013), cover price $101.89 | About this edition: Jones, Jacqueline A. 9780205001637 | 3 pck unbn edition (Prentice Hall, July 23, 2010), cover price $77.33 | About this edition: Explores American History through the theme of equality. Product Description: This access code card gives you access to all of MyHistoryLab’s grade-boosting resources! 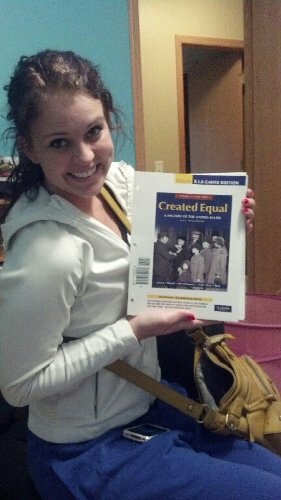 Want a complete e-book of your textbook, too? Buy immediate access to MyHistoryLab with E-Book online with a credit card at www.myhistorylab.com. 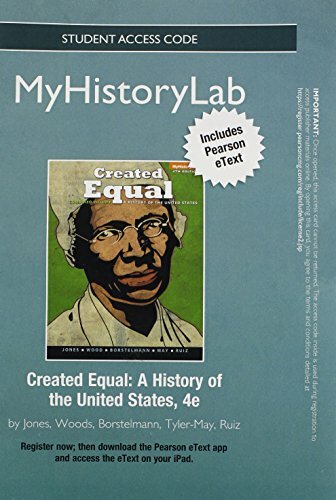 9780205687374 | 3 psc cmb edition (Prentice Hall, January 7, 2009), cover price $113.33 | About this edition: This access code card gives you access to all of MyHistoryLab’s grade-boosting resources! 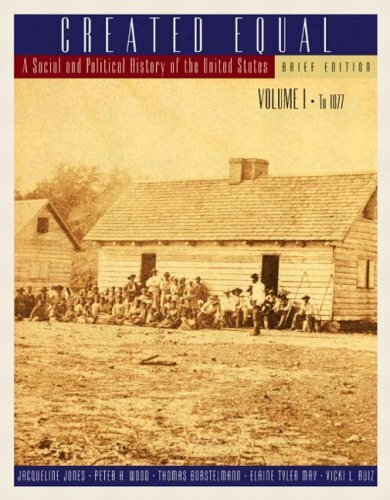 9780321429797 | 2 brief edition (Longman Pub Group, February 15, 2007), cover price $68.67 | About this edition: With its inclusive view of American history, Created Equal, Brief Edition, Volume Two emphasizes social history–including the lives and labors of women, immigrants, working people, and minorities in all regions of the country–while delivering the basics of political and economic history. 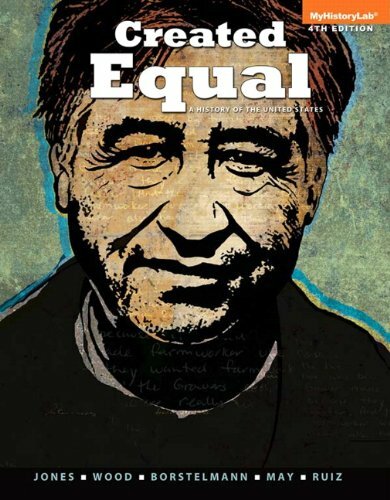 9780205900152 | 4 pck lslf edition (Prentice Hall, July 25, 2013), cover price $94.67 | About this edition: Re-examines American History through the theme of contested equality Taking an inclusive view of American history, Created Equal emphasizes the struggles for equality experienced by diverse groups of Americans across the many regions of the nation. 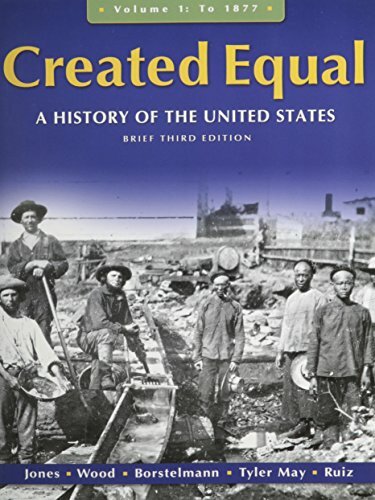 9780205899524, titled "Created Equal: A History of the United States: To 1877" | 4 lslf edition (Prentice Hall, July 22, 2013), cover price $86.00 | About this edition: Re-examines American History through the theme of contested equality Taking an inclusive view of American history, Created Equal emphasizes the struggles for equality experienced by diverse groups of Americans across the many regions of the nation. 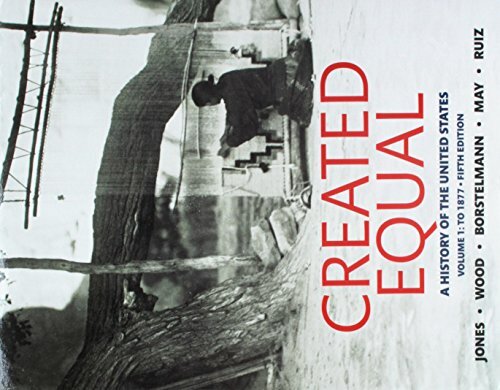 9780205962525, titled "Created Equal: A History of the United States: To 1877" | 4th edition (Prentice Hall, December 22, 2013), cover price $68.00 | About this edition: Re-examines American History through the theme of contested equality Taking an inclusive view of American history, Created Equal emphasizes the struggles for equality experienced by diverse groups of Americans across the many regions of the nation. 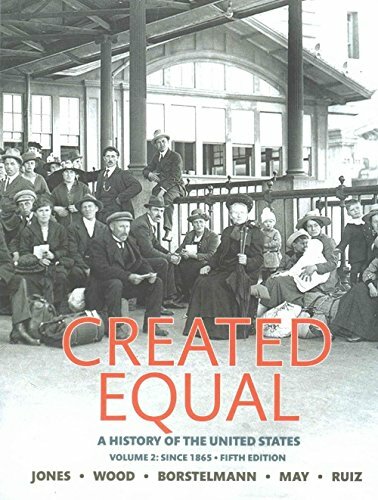 9780205728886, titled "Created Equal: A History of the United States: to 1877" | 3 brief edition (Prentice Hall, July 15, 2010), cover price $107.80 | About this edition: Explores American History through the theme of equality. 9780205585830 | 3 edition (Prentice Hall, January 15, 2008), cover price $149.80 | About this edition: With its sweeping, inclusive view of American history, Created Equal emphasizes social history–including the lives and labors of women, immigrants, working people, and minorities in all regions of the country–while delivering the familiar chronology of political and economic history. 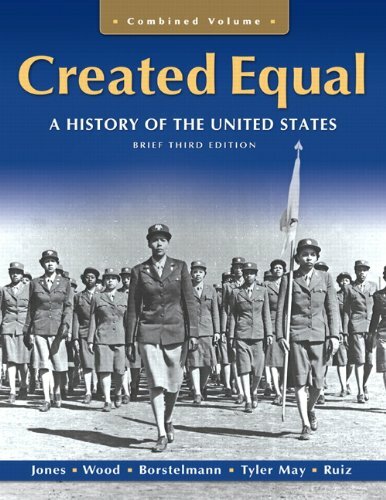 9780205728893 | 3 brief edition (Prentice Hall, July 25, 2010), cover price $107.80 | About this edition: Explores American History through the theme of equality. 9780205842179, titled "Created Equal: A History of the United States, From 1865" | 3 unbnd br edition (Prentice Hall, July 23, 2010), cover price $70.67 | About this edition: Explores American History through the theme of equality. 9780205585847 | 3 edition (Prentice Hall, January 15, 2008), cover price $149.80 | About this edition: With its sweeping, inclusive view of American history, Created Equal emphasizes social history—including the lives and labors of women, immigrants, working people, and minorities in all regions of the country—while delivering the familiar chronology of political and economic history. 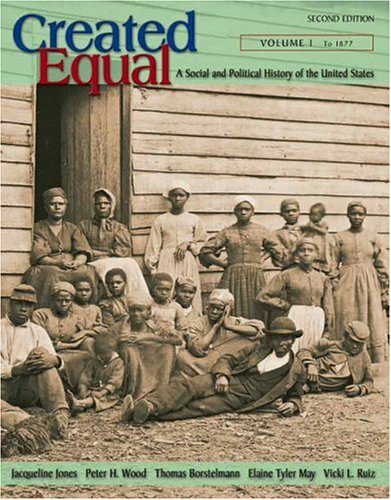 9780321318145 | 2 edition (Longman Pub Group, February 15, 2005), cover price $113.80 | About this edition: In its comprehensive and inclusive view of American history, Created Equal provides an accurate, broad, deep, and compelling view of the nation's past. 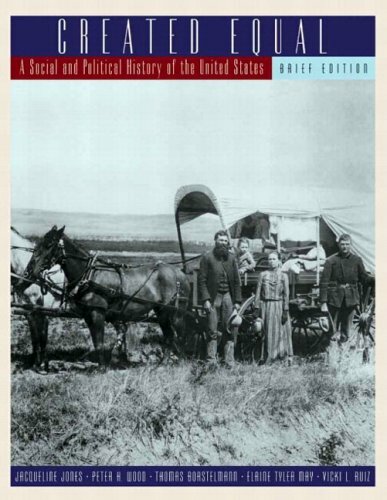 9780321345899 | 1 edition (Longman Pub Group, October 28, 2004), cover price $88.00 | About this edition: With its sweeping inclusive view of American history, Created Equal, Brief Edition emphasizes social history--including the lives and labors of women, immigrants, working people, and persons of color in all regions of the country--while delivering the basics of political and economic history. 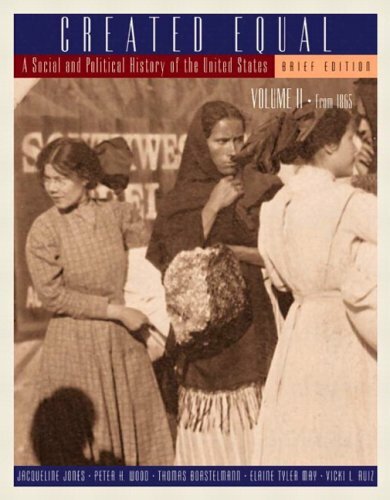 9780321345875 | 1 edition (Longman Pub Group, October 28, 2004), cover price $68.80 | About this edition: With its sweeping inclusive view of American history, Created Equal, Brief Edition, Volume II emphasizes social history-including the lives and labors of women, immigrants, working people, and persons of color in all regions of the country-while delivering the basics of political and economic history. 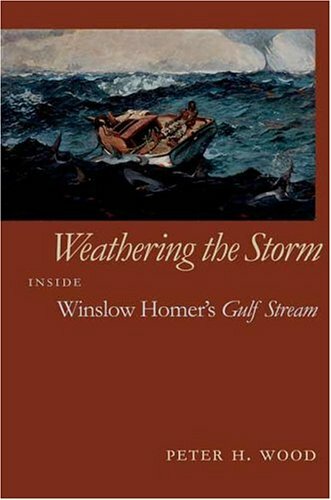 9780820326252 | Univ of Georgia Pr, July 1, 2004, cover price $29.95 | About this edition: Perhaps no other American painting is at once so familiar and so little understood as Winslow Homer’s The Gulf Stream (1899).